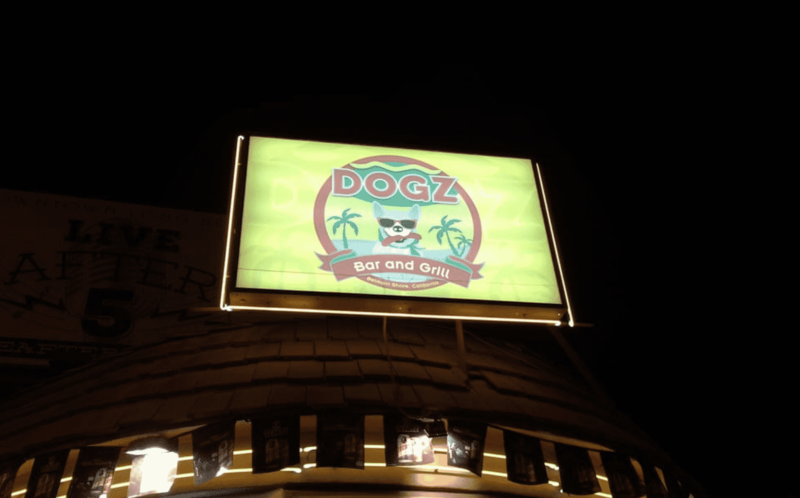 After facing a string of bad luck, Dogz Bar and Grill in Belmont Shore is finally ready to reopen its doors today for a soft opening and a formal grand opening Friday, April 12. Opened in 2011, the restaurant quickly became a staple of the Belmont Shore community after owner Ron Frontino and co-owner Norm Turley opened the space at 185 Glendora Ave., replacing the former Mexican restaurant Belmont Station. However, things went awry: In January of 2017, the restaurant became flooded after a delivery truck crashed into a fire hydrant at Glendora Avenue and Second, the corner where the restaurant sits. The damage was so severe that the city told him he had to re-build from the ground up. Then, after nearly 18 months of repairs and setbacks, a rooftop fire broke out in June 2018, setting the re-opening back even further. On top of this, Frontino has taken on another project—he plans on opening Jade, a Chinese concept, in the former Forbidden City space at Marina Pacifica—so he very much had his hands full but is genuinely happy to bring Dogz back to the Shore. “After many months of hard work, rebuilding, and going through the city process, Dogz is set to re-open,” said Third District Councilwoman Suzie Price in a Facebook post. Despite the inconvenience, Frontino said the “silver lining to the closure” is that the restaurant is completely renovated and easily welcomed into a Belmont Shore that is quickly changing. A long list of Second Street staples—from restaurants like The Spot Cafe to retailers like The Rubber Tree to candy shops like Rocket Fizz—have shuttered, leaving the popular stretch of economy in a constant state of flux. Dogz is located at 185 Glendora Ave.